ContactRelief recommends resuming contact with Clark County, Nevada. 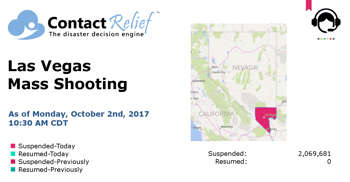 ContactRelief recommends suspending contact with Clark County, Nevada as a result of Sunday night's mass shooting at a Las Vegas music festival. Police report more than 50 dead and over 400 injured in mass shooting at music festival in Las Vegas, Nevada. Police report more than twenty (20+) dead and over one hundred (100+) injured. 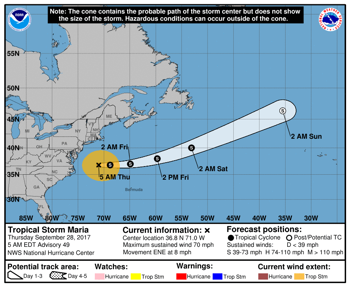 Maria has been downgraded to a tropical storm and will dissipate over the next few days. 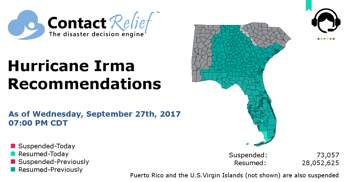 ContactRelief recommends resuming contact all Florida counties except for specified zip codes in the Florida Keys. 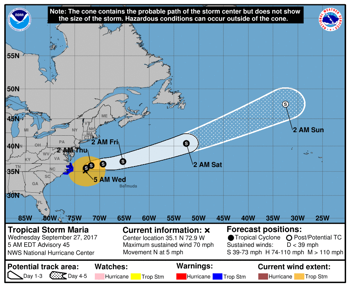 Tropical Storm Warnings issued for coastal areas near the North Carolina and Virginia border. 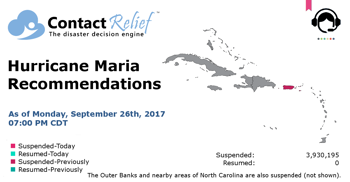 ContactRelief recommends suspending contact with the coastal regions of North Carolina until Tropical Storm Warnings are withdrawn. Can We Please Be Done With Hurricane Season? 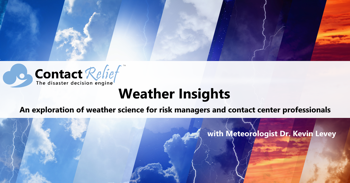 ContactRelief Consulting Meteorologist Dr. Kevin Levey looks at the state of the Atlantic and examines whether hurricane season is over.